December was such a long month, it started with the week of finals, weeks of family, rest, and relaxation. 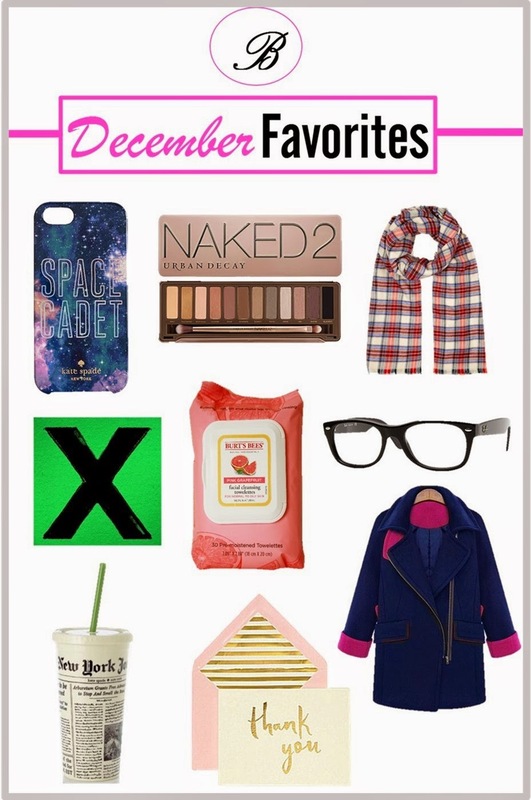 This months favorites ended up making me look super basic, but what is new? Kate Spade Phone Case| This phone case cracks me up. I love it because it says cadet, so it hits home for the ROTC thing, but it is also Kate Spade so it you are looking chic. Naked 2| So I am late to the game on the Naked palette, but this palette is so great. I love the silver colors in it. Blanket Scarfs| You can pretty much wear whatever you want, throw on a blanket scarf and you look put together. Also this scarf is perfect for traveling because you are essentially wearing a blanket. Ed Sheeran Thinking Out Loud| Oh. My. Gosh. This song. Honestly you can throw this song on repeat and never get sick of it. Burt's Bees Make Up wipes| This is the best makeup wipe I think I have ever used. It helps get ride of acne so it is double acting. Rayban Glasses| I needed Black Glasses for my ROTC summer training this year, so I go Raybans and I am in love. I usually hate glasses, but these things are so cute and really fit. Tumbler| This tumbler is so nerdy I love it. I have been super dehydrated lately with everyone's heat on full blast, so I make sure to carry this around with me everywhere I go. Thank You cards| Because It is after the holidays I have to make sure to get in all of my thank you cards, and how cute are these? Winter Coat| I mentioned winter coat choices (here), but this coat is PERFECTION. I could not get over how great this coat was all month.